Milk is the key to optimal health in a newborn puppy's life. The significant first few hours, days and weeks of newborn puppies' lives are all about proper nutrition to encourage growth and development. Fortunately, mama's milk offers all that the little guys need, nutritionally speaking. Once puppies are completely weaned, milk is no longer a necessary component of their diets. A mother dog's milk is the "be all and end all" of a puppy diet until weaning starts, containing all the vital nutrients the little ones need. 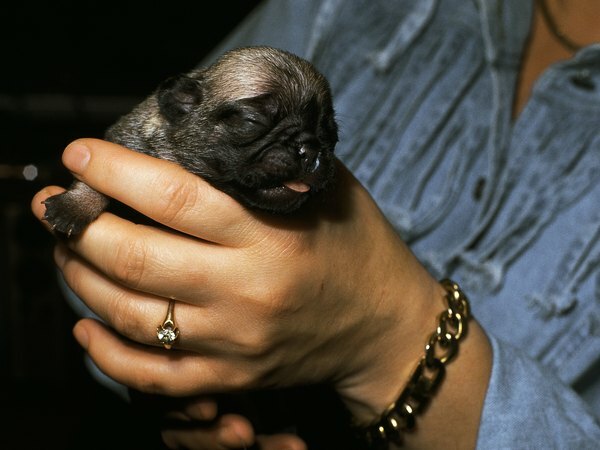 Mother doggies typically initiate weaning when their puppies are roughly 3 weeks old. Weaning is in no way instantaneous, however, and puppies usually stop nursing entirely when they're around 7 weeks old, according to the Merck Veterinary Manual. At this point milk is no longer necessary, and puppies are ready to start on diets of "real food" and water only. Puppies without mothers or doggie foster mothers also can stop drinking milk at approximately 7 weeks old. The only difference is that "orphan" canines drink commercial puppy formula through a milk replacer, rather than milk directly from mama or another lactating female dog's body. If you are responsible for feeding a motherless wee pup, try to phase out milk feedings entirely by around the seven-week marker. By this time puppies are physically prepared to begin eating commercial foods tailored to canine youngsters. Make sure the dog foods you purchase are labeled as being for puppies until they're about a year old. Puppies have no nutritional requirement for any type of milk other than the stuff from Mom. Abstain from ever allowing any puppies to consume cow's milk. For one, cow's milk in no way satisfies the nutrient needs of rapidly growing pups. Secondly, it can bring upon avoidable gastrointestinal discomfort in puppies—think tummy ache and diarrhea. Once weaning is a thing of the past, the sole beverage puppies need is exactly the same as what fuels human beings—water. You can start puppies on drinking clean water as soon as weaning begins. Put the H20 in a sturdy bowl on the ground, and make sure there always is plenty of it. It is important for dogs to always have ample drinking water close to them, from the puppy stage all throughout their entire lives. You never, ever want to risk dehydration in dogs—or in any animals for that matter. Do Dogs at 4 Weeks Drink Water?